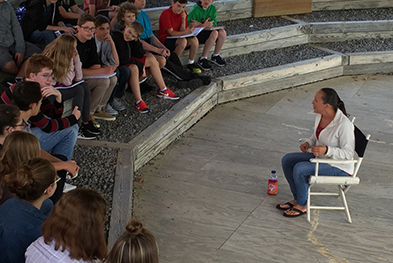 Freshmen circle around Amanda Tarbell to hear a story during the Global Humanities field trip to the Iroquois Indian Museum on Wednesday, Sept. 21. The ninth grade Global Humanities class did field work at the Iroquois Indian Museum in Howes Caves on Wednesday, Sept. 21 to learn about the Mohawks as a local example of an early river community. The trip was an opportunity to do authentic research for the “Geographic Luck” project, which charges teams of students to determine how geographic luck aided the development of early civilizations. As part of the project, teams will create time capsules that are representative of assigned civilizations. The museum houses archaeological and representative historical collections for the Iroquois, especially the Schoharie Mohawk. Students worked with Amanda Tarbell, the museum’s education program coordinator and cultural interpreter who is recognized for her storytelling. She spoke to students about the importance of artifacts. The teams will use this information to help them consider which artifacts they will include in their time capsules. For each time capsule, there must be 8-10 items. Each item must reveal some aspect of their assigned civilizations.Together, the artifacts must tell the story of the civilization, how it came to be, why it thrived, and how geography was involved.